DOUBLE your money on your 1st Deposit by Mr Green of £20 or more up to £100 in bonus cash. No bonus is complete without Free Spins! Play £20 in the Casino, to automatically unlock 100 Free Spins on the slot game – ‘Starburst’. In addition, you will also activate 20 days of 5 Free Spins a day to enjoy on a whole host of exciting games – that’s another 100 Free Spins! 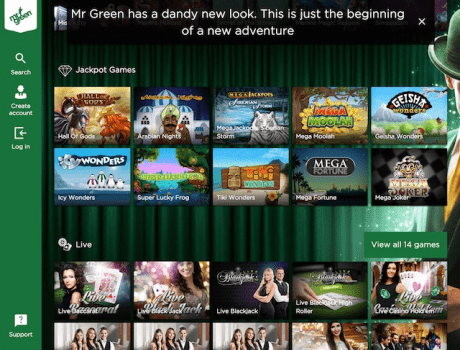 The Casino Bonus is a first deposit match bonus and will be credited only once the first deposit has been made with Mr Green AND the Casino bonus has been selected. Free Spins will be valid for 7 (seven) calendar days from the moment they are credited into the player’s account, unless stated otherwise. Free Spin winnings are bonus cash and must be wagered a total of x35 in the casino, in accordance with Mr Green bonus terms and conditions.